Swift C1 at Indianapolis - A day to day adventure. Ok! So days 1 and 2 done. Day 3 right now. First some tips for the new guys. HAVE YOUR DOCUMENTS WITH YOU. And make life easy on yourself, have your DOT physical done and cdl permit in hand BEFORE coming to training. Make sure to have your long form physical with you. Drivers license and permit, SS card and Birth certificate. I say this because many people came here without it and a few got sent home. Next. LISTEN to the instructors and dont give attitude. I won't say anything more on this. So. First day was easy, paperwork, paperwork, and more paperwork. Also DOT physical if you need it, and drug screen. Second day: Demo of pre trip. We are given binders and forms and everything we need to learn. We also did a few tests. We were given time to go out with an instructor and shown a pre trip. We are also given time to do it ourselves a few times. Third day, more tests, and a lot of focus on helping ourselves. By this point you have found who you are working with. Me and another student teamed up. We are given LOTS of time today to go out and work on pre trip Inspection. See a pattern here? My advice, dont study pre trip before showing up here. Indiana has a very specific way to do pre trip, and c1 expects it done their way. Learn it here, learn it their way. It's simple, just study it and do it with a partner, correct eachother and learn. Third day down and loving it. The instructors are here to help, but will not hold your hand. Be respectful, and everything falls into place. I love hearing these. You all going forward and learning. I start school this Monday and cannot wait for my own stories. Ah got it. Couldnt tell. So, no straps on the engine itself? Or does the engine go outward in the box so the straps are on the wood, but there is engine beneath them? Awesome progress report. Glad to know that the newer guys are doing well. And called me out Haha. I should be there around 6pm sat. Well, here I go. Scheduled for the Indianapolis c1 through Swift. Starting Monday March 25th. Let me start by saying thanks to everyone here. Because of the knowledge gained here I decided to begin a new adventure. So. First things first. After talking to *insert generic name here* with Swifts recruiting for the last 3 weeks we settled on the 25th so I could get my Picture Permit in the mail. It arrived today. After I got it, I made the call and she finalized my start date. I decided to drive down to Indy, for the convenience of NOT needing to wait on the taxi, and go to the store when I want. I asked *insert generic name here* if I could go a day early so I could get settled in and not be rushed. She immediately emailed me a voucher for Saturday night, the 23rd. Awesome! Now to packing. I am bringing with me: 3 pairs Jean's, 2 pairs slacks, lots of socks, lots of boxers, 5 shirts, a pair of Carolina work boots, a pair of shoes and a hoodie and jacket. For security of ny paperwork and birth cert and ss, I purchased a simple and cheap "safe" like 20 bucks. It's nice and sized for regular paper documents. Well. Next update will be sunday the 24th. Also once school starts, daily updates unless too busy. Again, thank you all for the info given here! Never used the screen grab before with the Stylus, Just tried it, pretty slick. If you have any of the "newer" smart phones. You can take "screenshots" of what you are seeing. So, like on my Note 9, if I press the "power button" and the "lower volume" button at the same time, it will screenshot, or take a photo of what you see on ur screen. You can then post just like any other picture on ur phone. Thanks Big T. Also, thanks Triscuit! It isn't. I heard over the interwebs that swift was auto, his last comment about "shifting" simply provoked a question, to which I then asked. Thank you, you do not think its an auto. All I wanted to know. That could mean shifting from Drive to Reverse, etc. I just want to confirm Manual or Auto. That does not confirm it to me. So a quick question. Are the training trucks Auto or manual? I know I heard somewhere they were switched to Auto, but can you confirm or deny this for me? Thanks! Thank you for this! I start my class for Swift at Indianapolis on the 25th. I will be keeping a close eye on your posts! What are your on the road hobbies? Automated manual is what is in my Focus.... its a blessing and a curse. Hope these trucks have a better version. Anyone see improvements for gas mileage? Or lower? I know Rainy said hers was lower, anyone else? 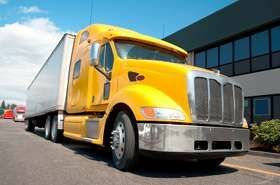 I do not have any experience yet with trucks, as my class starts the 25th. But, I love info.